ALL SALE REFUNDS WILL BE REFUNDED AFTER ORDER HAS BEEN PROCESSED. #A021 Santa Baking Dish Filled With Potpourri and Homespun! Santa Bread/Loaf Baking Dish�designed with 3 Different� Santas on the front and back of the dish is filled with potpourri.Dish is dishwasher�and microwave safe.�Measures 5 3/4" long,3 1/2" wide, 2" tall.Click picture to see larger image of item! #A178 Primitive Stitchery Pattern "Snowman with Stars!" Spice Mat / Sachet Pattern! 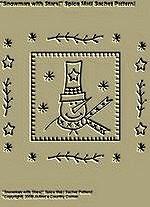 Primitive Stitchery Pattern "Snowman with Stars!" Spice Mat/Sachet Pattern can be used to make Spice Mats, Sachets, Ornies or Ornaments. You can fill the Spice mat or Sachet with scented potpourri and use it as a coaster for cups or to put in draws. You may purchase the potpurri from my site if you so choose. #A185 Primitive Stitchery Pattern, "Cherish Family and Friends!" Spice Mat and Sachet Pattern! Primitive Stitchery Pattern, "Cherish Family and Friends!" Spice Mat and Sachet Pattern! Pattern can be used for mats filled with wonderful scented potpourri to put hot coco or tea on, filled for sachets, ornies or ornaments. Measurements are 4 3/8"x 4 3/8". Potpourri is available for sale on the website. #A186 Primitive Stitchery Pattern,"Star Willow Tree!" Spice Mat & Sachet Patten! Primitive Stitchery Pattern, "Star Willow Tree!" Spice Mat and Sachet Pattern!�Pattern can be used for mats filled with wonderful scented potpourri to put hot coco or tea on, filled for sachets, ornies or ornaments. Measurements are 4 3/8"x�4 3/8".�Potpourri is available for sale on the website. #A187 Primitive Stitchery Pattern, "Snowman with Mittens!" Spice Mat & Sachet Pattern! Primitive Stitchery Pattern, "Snowman with Mittens!" Spice Mat and Sachet Pattern!�Pattern can be used for mats filled with wonderful scented potpourri to put hot coco or tea on, filled for sachets, ornies or ornaments. Measurements are 4 3/8"x�4 3/8".�Potpourri is available for sale on the website.